For me, 2011 was not a particularly good year. In fact, business-wise it has been the worst in, literally, decades. We also lost our oldest cat, and indeed, cats all around us did not fare well: two strays, taken to the shelter on two separate occasions (once by us, once by neighbors of us) were killed by the Humane Society, another cat that belonged to a neighbor, one that we knew since 1997, succumbed to old age, as did the oldest cat of an American friend of mine just a few days ago. Yes, we’ve had happier years than 2011. But then again, we remain healthy, safe and secure, so we do count our blessings still. What will 2012 bring? The collapse of the Euro? A major war in the Middle East, perhaps over the issue of the Strait of Hormuz? A Chinese economic meltdown, precipitating a worldwide crisis? 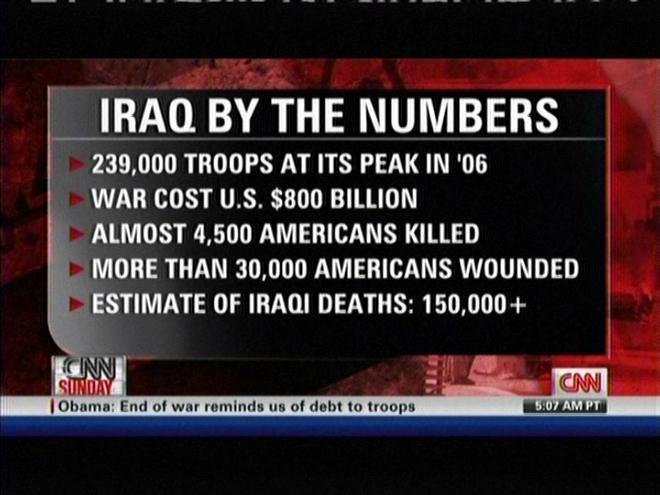 More wars and suffering? Or a strengthening of the Eurozone, with new institutions that will prevent similar crises in the future? Peaceful resolution of the issue with Iran, perhaps an end to the ayatollahs’ regime? Finally, full recovery from the economic woes of the past few years? I understand that shelters, especially municipal shelters, must make unpleasant decisions every day about animals that cannot be rescued or are unadoptable. But these decisions should not be made callously and heartlessly. What is appalling is that in all these cases, there were people able and willing to care for the animal that was killed, but the humane society in question never gave them, or the cat, a chance. 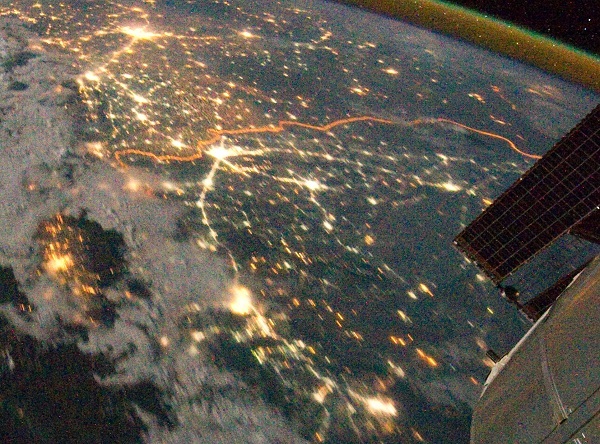 Notice that strange orange line intersecting the landscape. Yes, that’s the border alright. It’s lit by floodlights along its entire length. 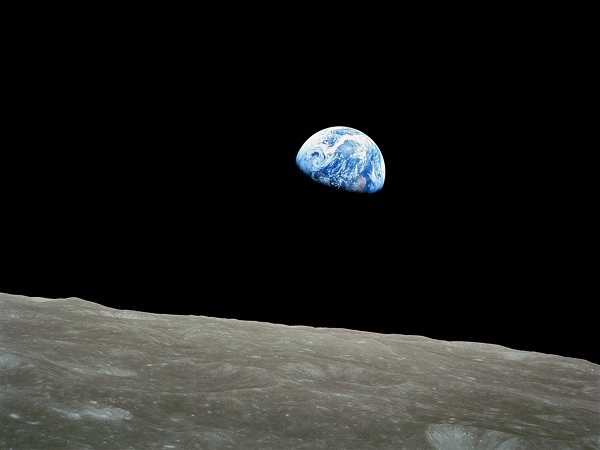 In 1968, the crew of Apollo 8, for the first time in the history of humanity, disappeared behind another celestial body. When they re-emerged on the other side and saw the Earth rise over the lunar landscape, on much of the Earth it was Christmas Day. You don’t need to be religious to find this moment awe-inspiring. I just added a WordPress plugin that will tweet all my blog posts. 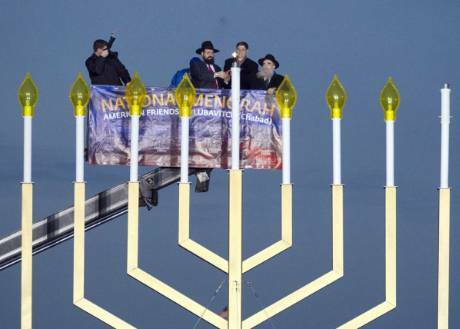 It almost sounds like some crude ethnic joke: how many rabbis fit into the basket of a cherry picker? And the answer is, well, one fewer if you also include a photographer (who, presumably, is not himself a rabbi). So my question is… was it worth it? Even if we ignore the fact that Iraq may yet become a satellite state of an increasingly powerful Iran and as such, a worse security threat than Saddam Hussein has ever been, his evil sons and chemical attacks on civilians notwithstanding? An e-mail from someone reminded me that whereas I posted a comment here in my blog on the death on Kim Jong Il, I neglected to comment on the death of Vaclav Havel. Goes to show that notoriety is often a more direct route to greater fame than doing the right thing. I know it’s bad form to rejoice upon the death of a human being, but I cannot say that I have any inclination to shed a tear over the death of North Korea’s totalitarian dictator, “Dear Leader” Kim Jong Il. 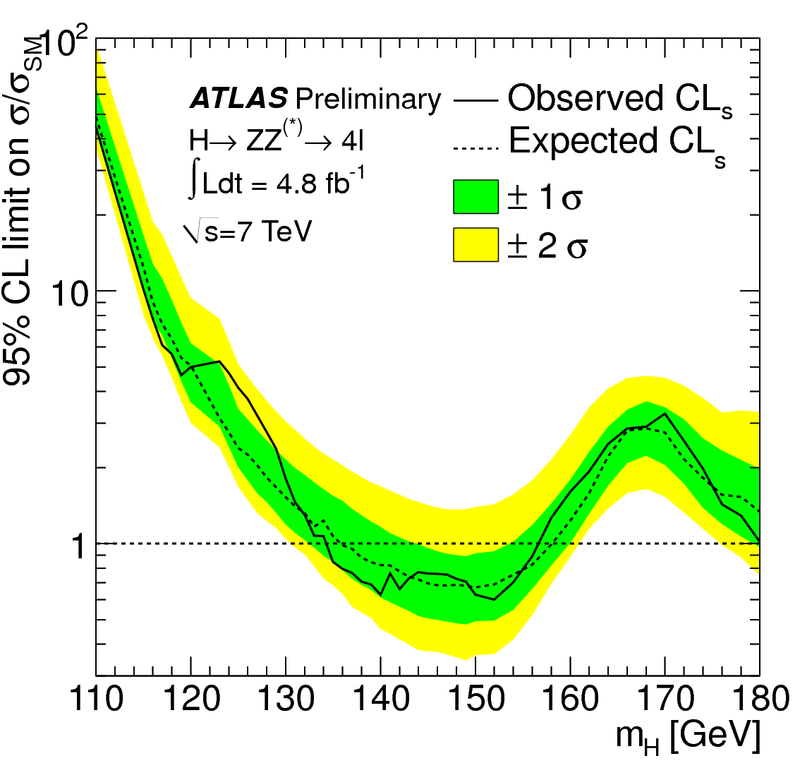 So I am reading details about the on-going search for the Higgs boson at the LHC. The media hailed the announcements this week as evidence that the hunt is nearing its goal… however, this is by no means conclusive, and instinctively, I’d be inclined to come to the opposite conclusion. So why does this leave me skeptical? Simple. 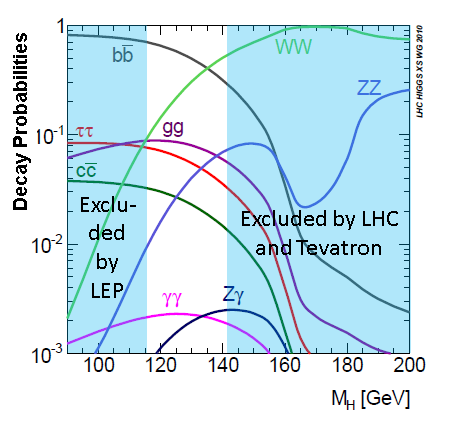 First, we know that the ZZ and WW decay modes are far more likely than the diphoton (γγ) decay. So naively, I would expect that if the signal is strong enough to produce noticeable bumps in the diphoton plot, very strong peaks should have been observed already in the ZZ and WW graphs. 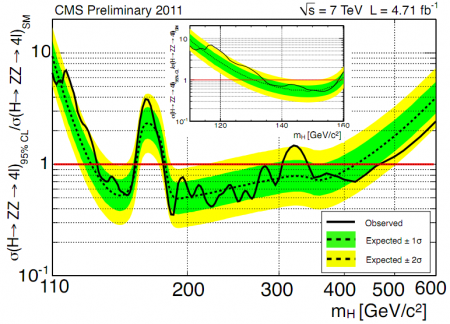 Instead, we see signals there that are even weaker than the bumps in the diphoton plots. While this is by no means rock solid proof that the Higgs does not exist, it makes me feel suspicious. Second… well, suppose that the Higgs does not exist. 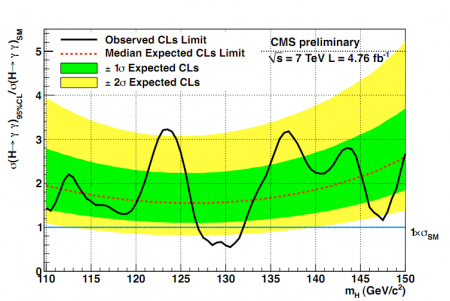 We always knew that it is the low energy region, namely the region that is still under consideration (the possibility of a Higgs that is heavier than 130 GeV is essentially excluded) where the Higgs search is the most difficult. 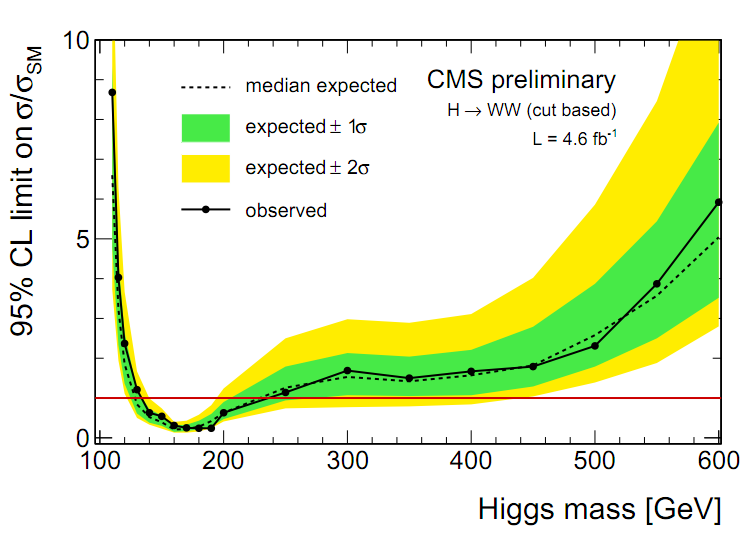 So if no Higgs exist, this is precisely how we would expect the search to unfold: narrowing down the search window towards lower energies, just as the data becomes noisier and more and more bumps appear that could be misread as a Higgs that’s just not there. Then again, I could just be whistling in the dark. 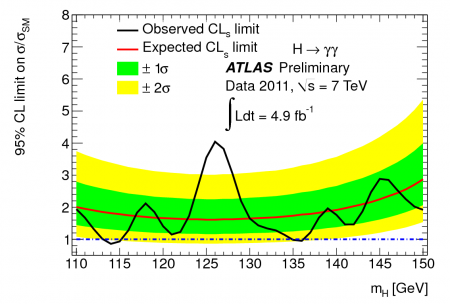 We won’t know until we know… and that “until” is at least another year’s worth of data that is to be collected at the LHC. Patience, I guess, is a virtue. There is only one observation I’d add to Frum’s comments. The people he speaks of… they’re not “conservatives”. They abandoned conservative ideals when they jumped on the radical right-wing agenda of the tea party movement or started parroting the radical right-wing trash coming from talk show hosts like Limbaugh. The BBC has a very informative article about the on-going search for the Higgs boson at CERN; and they even managed to squeeze in a sensible definition of the term, “inverse femtobarn”. I am impressed. A while back, I wrote an e-mail to James Moore, Minister of Heritage, expressing my concern that the proposed new copyright legislation (Bill C-32) is going to turn me into a de facto criminal for the mere act of copying legally purchased DVDs to my computer’s hard drive for easy viewing. Yesterday, much to my surprise, I received a reply. In his reply the Minister explains, among other things, that “copyright owners may decide whether to use technological protection measures for their content and consumers whether to pay for such content”. In other words, screw me, it’s laissez faire capitalism. (In fact, he’s preaching to the choir: I stopped purchasing software like computer games eons ago because I despise Activation-type technologies.) Except that… our Minister and his government already decided that it is NOT laissez faire capitalism since government intervention (in the form of criminal sanctions, no less!) is required to protect the interests of copyright owners. The Minister’s reply is also representative of this government’s very callous attitude towards culture in general: by stating that “Copyright is a marketplace framework law”, the Minister makes it clear that they see intellectual property only as marketable products, and the consumption of culture as merely a voluntary consumer activity. I wonder if they maintain the same attitude towards, say, food or health care: in the marketplace, after all, consumers have a choice whether or not to purchase foodstuffs, right? Their plans concerning copyright law was one reason why I did not vote Conservative this time around, and it seems that my concerns were well justified. Now my hope is that as this legislation passes, its ridiculousness will eventually become evident, and either the Supreme Court will step in or a successive government will make the necessary changes.